Have you noticed that you eat lunch more at your desk every day? I certainly have. With 7 hours of meetings (at least) every day plus 300+ emails every day, we’re busy. I’d argue that most companies these days are busier than they were historically. At the same time, everyone is focused on wellness and healthier choices. When sleep, diet, exercise, and stress are all related to health, it’s hard to separate those from the workplace. That being said, I wasn’t too surprised by this recent poll I saw which highlights this. The Wall Street Journal on 1/8/13 had an article called “New Rules for Boosting Good Cholesterol” which shared the results of a recent study on medications that improve HDL (or Good Cholesterol). “Not all HDL are created the same” was what Roger Newton, chief science officer of Esperion said. “If you raise HDL in non-pharmacologic ways, it really does help you” says Steve Kopecky, a Mayo Clinic cardiologist. Improving good cholesterol is important. What are my risks and the value of medications? For that, I found two online risk tools. Here’s a simple one that uses the Farmingham study to estimate your risk of having a heart attack. A clinician was talking to me he other day about “sitting disease“. They said that our increasingly sedentary lifestyles are causing all kinds of problems – not least of them being obesity. 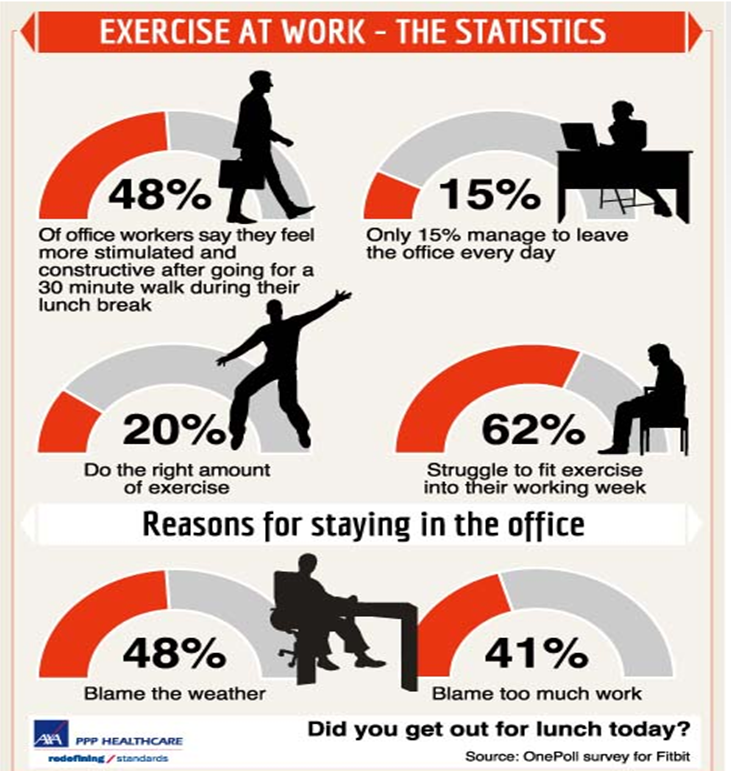 Stuck working in an office with no time to hit the gym on a regular basis? There are ways to burn off a few calories during office hours, says Selen Razon, a physical education professor at Ball State. • Start exercising before arriving at your desk by first parking your car as far away from the building as possible and then walking. • Take the stairs whenever possible. • Do exercises at your desk, including flexing arms, legs and abs on 30-second intervals. • Get rid of a chair and sit on a medicine/fitness ball while working. Sitting on a ball will tone and strengthen your abs. • Stand up and/or take short walks every 20 minutes at desk. Studies show even simple frequent standing breaks significantly decrease your chances of getting diabetes. • Exchange the typical desk for one that allows you to stand, which burns more calories. • Bring gadgets to the office. Hand grippers and stretch cords are relatively cheap and can provide great outlets for keeping active while you look at your screen. I talked about the Wii a few months ago when we first got one. At the time, I didn’t know that Wii Fit was coming. This past weekend we happily bought it, and I enjoyed it. It tells you your BMI. You can do yoga. You can do aerobic exercise (running, hula hoop, step aerobics). You can do agility exercises (downhill skiing, tight rope walking). I was a little skeptical, but I have been fascinated by the Wii so far. And, I loved the fact that my 6 year old could get into it. She loved that once you put in your height, and it calculates your weight that it changes your Mii (avatar) to reflect your likely dimensions. She spent lots of time on the yoga moves that I probably never could have gotten her to do in a traditional forum. This creative use of technology gives me a lot of hope for how we can teach our youth, drive rehab programs, and impact people. Now what I am looking for is when will we see a competition to lose the most weight only using the Wii for training.